These storage tins are perfect for keeping your hot beverage favourites safe and clean. 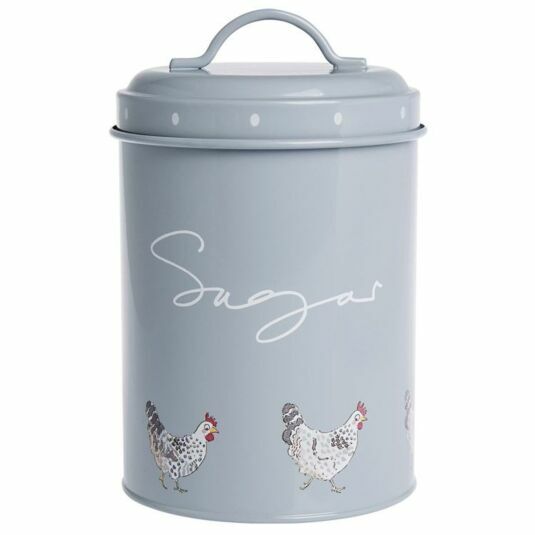 Made out of high quality galvanised steel, these tins is a great gift for those with hens, or for your own house! 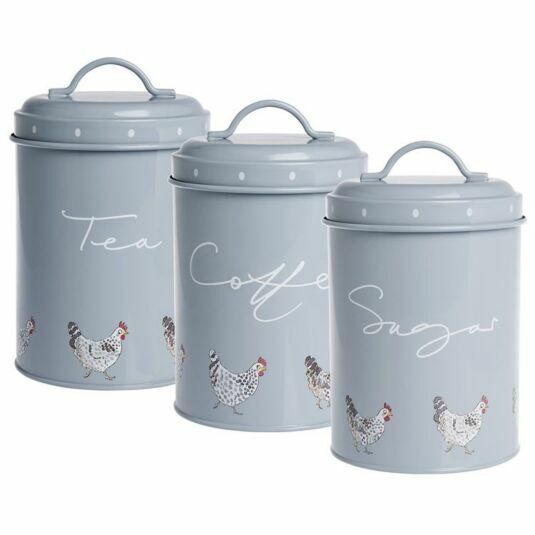 Whether its Tea, Coffee or Sugar, these tins are sure to look great in any kitchen in their sage grey colour with white eggs dotted around the lid. 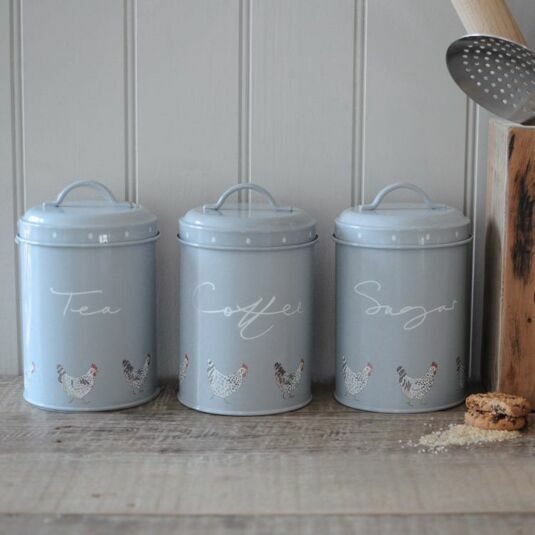 Part of Sophie Allport’s Chickens collection of kitchenware and kitchen textiles, this set of three tins are decorated with beautiful illustrations of Speckled Maran Hens and labelled in Sophie’s signature handwriting, these tins will be sure to turn heads in your kitchen. Classy, elegant, and full of country chic charm, it will make a gorgeous addition to any kitchen. 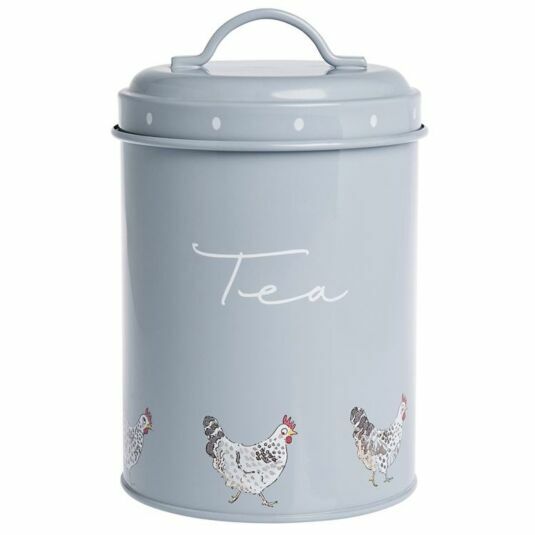 For that extra special gift, add a matching item from the same range, such as a Chickens, biscuit barrel, mug or tea towel making this a great present for friends and family. Each tin has a capacity of 0.5 litres, has a base diameter of 11cm stands at 15cm high. Due to the materials used in these tins, please hand wash in cold water with a soft cloth. Dry Immediately. The classic Chicken’s range from Sophie Allport includes a collection of stylish kitchen textiles, oilcloth, tinware and fine bone china. Each featuring Sophie's quirky hen illustrations, they are sure to make a wonderful gift, whether you are a fan of the farmyard animal, or just of Sophie’s delightful illustrations. .